In pure inspiration the cycle begins again. Once again, I was left in the dark; clouds filled the sky on the night of the full moon and there was nothing for me to gaze at in order to find my inspiration. I had to imagine it all. I find that I am generally fascinated by water color quilts & the idea of taking the traditional quilting methods and weaving them into an art piece. I love that I can create a piece from tiny little squares of fabric that give you the impression of texture. Have you ever looked at a stormy sky? At first glance, it seems like it is all one color, but there are shadows and tints and shades hiding in those clouds. The same goes for the moon, it is not one solid color either. That is the idea that I am attempting to convey by piecing both the sky and the moon with tiny 1 inch squares, the texture of a stormy sky and the true face of the full moon. The piece is quilted using three colors of thread in a style usually used to convey the impression of water – here it is also used to convey water, just in a different form. 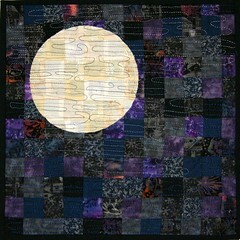 Tagged Art, full moon, moon, pieced, piecing, Quilt, Quilting, Storm Moon. « Yesterday there was S.E.X. I love how you play with the different threads and layers! Is this quilt for sale? Please contact me. Sorry to say this quilt was sold quite a while ago and is now happily living somewhere in the U.K. If you’d like something similar, I would be happy to work with you on a commission.